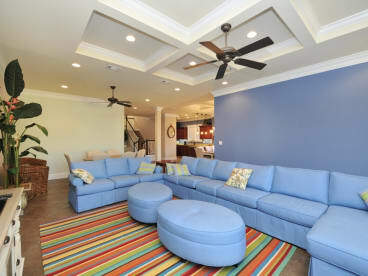 Thank you for thinking about renting our Destin home! Our home, Summer Dreams, has been our dream for several years. We built this house to enjoy with our family and friends. This is not a normal rental property. We wanted a place that no one would forget. Our daughters are active in all sorts of activities. So, like you, our lives are very busy. The beach gives us a chance to unplug and relax. We do not rent to just anyone. We are only willing to rent to families that will treat our home like it was their own. We have no interest in renting to college kids (or by their parents). We love the idea of families coming together and making memories. That's why we have a master suite on the first floor. It allows you to bring the grandparents! We promise the pictures you see are indeed what is in the house. We bought beautiful furniture. You are going to love it. We did not skimp on any area of the house. At least we tried not to. My wife wanted a nice private pool area, I wanted a 'man room' and the girls wanted a game room. Well, we decided to add all three. This house has everything you need to enjoy yourself. So relax, have fun, and make some memories.